I bought them in the brown, light grey and off white and they are simply perfect for wearing under short sleeved tees, chunky jumpers and shirts to keep in the warmth. 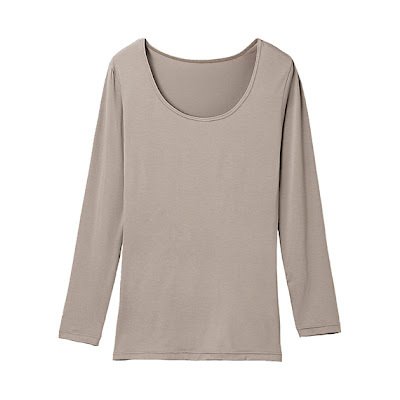 I originally bought Uniqlo's Heattech tops a few years ago and cannot recommend them highly enough, they are comfortable and come in a great range of different styles and colours as well as accessories. They are available in store and online too. This is not a sponsered post, just a very satisfied customer who loves Uniqlos range of clothing. What will you be wearing to keep snug this winter and who do you recommend to keep you warm-stylewise, that is-not hubby or the hot water bottle!! Have a great week ahead and thanks for visiting! It seems you're going to do a mix of modern and thrifted pieces lately? Really love that! Why focussing just on one thing when great bargains are anywhere - at the highstreet, in charity shops and on high end boutiques such as liberty's? Really love that! I love my Uniqlo Heattech - bought leggings and a couple of long sleeved tops to wear in the Arctic Circle a few years ago - and it really works! I'm in need of layering pieces. Thanks for the tip! Thanks for sharing, the heat tech top looks great. I may have to invest as I am so fed up of feeling cold allof the time. Would be great for camping too! I am so glad to see you again.